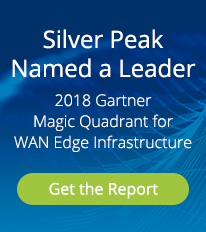 Dynamic Path Control (DPC) is a key feature of all Silver Peak WAN products, including Unity EdgeConnect. DPC provides real-time traffic steering over any broadband or MPLS link based on company-defined business intent policies. In the event of an outage or brownout, DPC automatically fails-over to the secondary connection in less than one second. DPC enables organizations to fully-utilize all deployed bandwidth at each location. Enabling the simultaneous use of multiple WAN links has traditionally been difficult because of limitations in routing protocols. 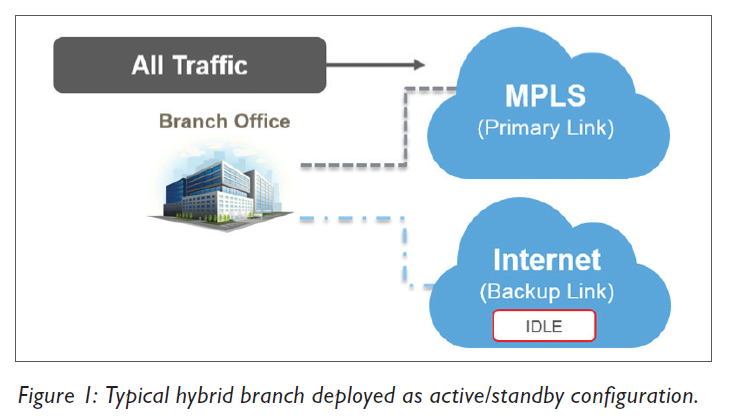 Often an enterprise will have branches with MPLS as a primary WAN link and an idle Internet link for backup. This scenario wastes a great deal of bandwidth. DPC eliminates the active/standby configuration, improving the reliability and performance for branch office applications. 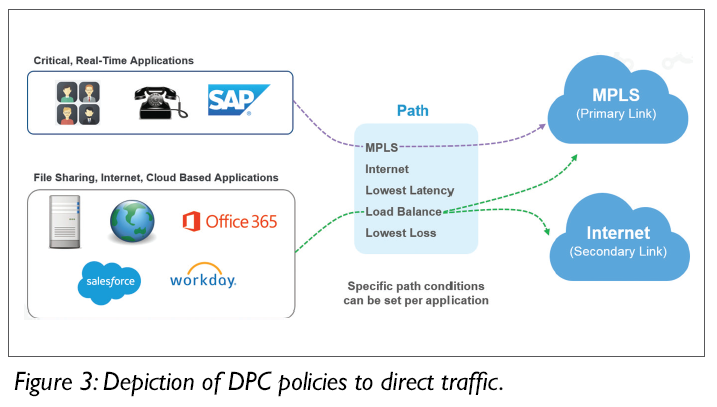 The traffic engineering decision is made by DPC, not layer-three routing, intelligently routing or load balancing traffic across the available links. This allows what was a standby line to be brought online without the complexity of pure layer-three routing. Customers can create policies that help them make more intelligent decisions about how the WAN links are used and which path is used by each application. For example, a user can create policies that would route their most critical traffic such as VoIP, video conferencing and ERP traffic to always use the MPLS network, while the rest of the traffic is load balanced (see Figure 3). The provisioning of traffic across multiple WAN links can be as granular as needed. Simple deployments can be as easy as a single policy, while more advanced deployments can be configured to route different applications based on specific metrics that work best for each application. For example, you could route VoIP traffic over the link with the least amount of packet loss, while storage replication runs across the link with the lowest latency. Silver Peak Unity EdgeConnect was designed to allow these DPC configurations to be created in seconds, with simple point-and-click setup. Administrators can centrally manage how any application behaves across the enterprise WAN through the Unity Orchestrator management dashboard. There is no need to make any of these changes manually on a site-by-site basis. DPC can be easily configured via the Silver Peak Unity Orchestrator, which allows for centralized configuration. These options provide granular control over how traffic is directed across multiple WAN links. Deploying Unity EdgeConnect enables simple active-active deployments that leverage all available bandwidth, regardless of size or type. Dynamic Path Control policy options are configured via the Route Policies configuration page, and can be applied based on subnet, application type, protocol, VLAN, or DSCP information.